For something many deem a 'health food,' sprouts regularly appear on official outbreak lists. You will never catch prominent food-safety attorney Bill Marler eating sprouts. Not on a heaping deli sandwich. Not on a freshly tossed salad. He puts them in the same category as raw milk — a food item he says is not worth the risk it carries. Unfortunately, 13 people sickened across four states have discovered that risk the hard way. 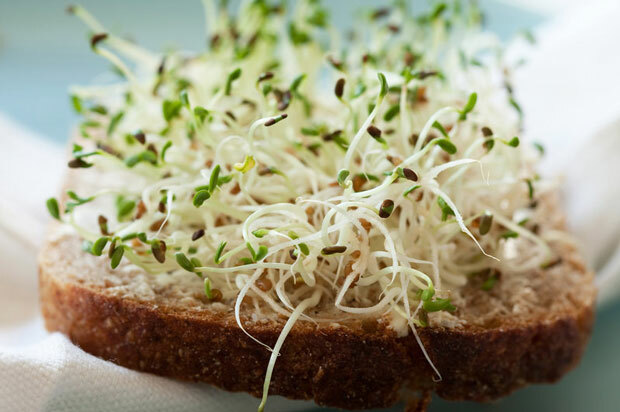 On Monday, the Food and Drug Administration and Centers for Disease Control and Prevention announced they&apos;re investigating a multi-state outbreak of Salmonella Muenchen linked to alfalfa sprouts produced by Sweetwater Farms LLC in Inman, Kan. Both irrigation water and alfalfa sprout samples have tested positive for salmonella, prompting the company to issue a voluntarily recall of sprouts from lot 042016. States affected include Kansas, Oklahoma, Missouri and Pennsylvania. And Wednesday, news broke of another outbreak linked to alfalfa sprouts. Nine people in Minnesota and Wisconsin have been sickened so far by E. coli-tainted sprouts. Health officials are warning consumers, retailers and restaurants to avoid sprouts grown by Jack & The Green Sprouts in River Falls, Wis.
For something many deem a "health food," sprouts regularly appear on official outbreak lists. Since 1998 there have been at least 49 foodborne outbreaks, including 24 multi-state outbreaks and 1,737 illnesses tied to sprouts, according to a tally kept by Colorado State University. Sandwich chain Jimmy John&apos;s experienced multiple outbreaks linked to sprouts in 2008, 2009, 2010 and 2012. Sprouts are still on the menu, but place your order online, and a less than appetizing warning pops up: "The consumption of raw sprouts may result in an increased risk of foodborne illness and poses a health risk to everyone. Click &apos;Yes&apos; if you understand the potential risks, or &apos;Cancel&apos; if you&apos;d like to continue without adding sprouts." Jimmy John&apos;s may feel comfortable behind their warning label, but offering sprouts is a risk that Kroger and Wal-Mart no longer take — both grocery retailers have deemed sprouts too dangerous to sell. In announcing its decision in 2012, Kroger said it was based on a "thorough, science-based" review. Sprout seeds need warmth and humidity to grow — which also happen to be ideal conditions for pathogens to flourish. Because of the number of outbreaks associated with sprouts, the FDA developed special requirements for sprout growers within the Food Modernization and Safety Act that is just going into effect. A few years ago, the agency also helped launch the Sprout Safety Alliance, with the Institute for Food Safety and Health at the Illinois Institute of Technology. Linda Harris, a microbiologist at University of California, Davis, says sprouts continue to be a problem because they&apos;re challenging. Whether they&apos;re alfalfa, mung bean, red clover or radish sprouts, they&apos;re grown in warm environments and usually eaten raw. "Efforts to reduce risk include testing seed, testing seed water. Soaking seed in sanitizers is another — none of which are foolproof," says Harris. "It reduces risk, but the fact is, we still see outbreaks on a regular basis." Continued outbreaks are one reason Marler has been crusading for a warning labelsimilar to the one adopted by Jimmy John&apos;s. At least, until a magic bullet emerges to fix the problem. Harris says that hasn&apos;t happened yet. "I think there&apos;s been an effort to find some solution, but honestly, as a microbiologist, I think [sprouts are] always going to be a higher-risk product, at least under current technology," says Harris. Foodborne illness outbreaks are serious stuff. Roughly 1 in 6 Americans (or 48 million people) get sick, 128,000 are hospitalized, and 3,000 die of foodborne diseases each year, according to the CDC. For now, the investigations into these outbreaks are ongoing, and health officials are warning consumers not to eat sprouts from Sweetwater Farms or Jack & The Green Sprouts.